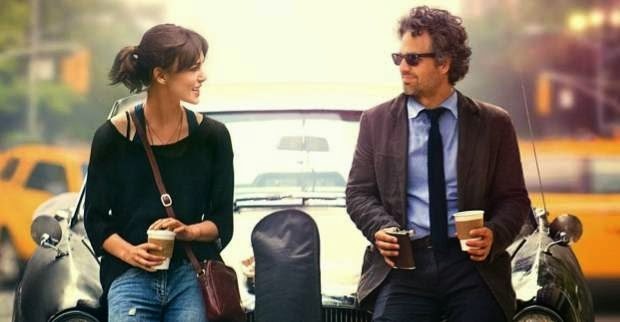 Well, whomever edited the trailer for Begin Again, did a better job at film making than whomever the full-length movie. We saw the preview at two different movies and I will admit to being the one who wanted to see it more. On a lark eight years ago, we went to see a yet unknown movie called Once, which I loved. It was an unassuming movie where almost nothing happened but it still intrigued you. Or at least me. They might have just called this movie Twice. It was all very pleasant. I like Mark Ruffalo (hey, he's the Hulk). I like Keira Knightley (loved her in Bend it Like Beckham and the little seen Looking for a Friend at the End of the World). 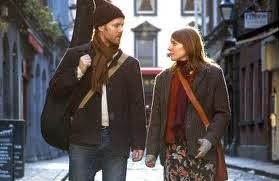 But I can't help think that the writer / director, John Carney, did this all before and better.....eight years ago. Both films had musicians who had been dumped and down on their luck and a saviour of sorts (who is separated from their spouse) who lifted them up, gave them the hope of success (but not actual success) and miraculously not end up together. That last part would be the movie anomaly if Carney didn't do the exact same thing and better....eight years ago. I get that we in the U.S. have a short attention span. I also get the 'go with what you know' mentality. And I get the studio's thing of, "hey, it was a hit before...." but this time it was all very average. Still - the same movie basically twice and twice in a row? Apparently, someone felt the need to bring in Adam Levine to play a "rock star"....with that less-than-Jamiroquai-like scrodeling that he calls "singing". (what a stretch.) His acting talents should be reserved for staying silent and taking off his shirt - neither of which he does in this movie (oh...yeah....Spoiler Alert). Honestly, two of his songs were sooooooo bad - so maybe he wasn't "acting". In Once, I found the music engaging. Hell, I bought the soundtrack. With Begin Again, the songs are mundane....at best. Knightley does her own singing, and she's not bad, but it's not stellar - though it is not supposed to be. And then, there is the lame material she had to work with. But it is the little things that make me roll my eyes: going to a rapper's house (Cee-Lo Green, who is way more natural at acting than Levine), and you see the skyline of Los Angeles, even though the movie takes place in NYC. Or the recording session on top of a building that miraculously has a recliner, a table with a lamp on it. Or the whole set-up of Ruffalo's daughter who is to play guitar on one song, her mother goes on about how horrible she is on the instrument and of course in one take nails the part like a seasoned pro...........even though she's never heard the song she's supposed to play on, let alone ever rehearsed......and she's 14 (though looks 29). And yes, those musical things happened in Once too. First time it was cute....second time it was much harder to overlook. Ruffalo is fine in his role. He's done much better in other films. It is Knightley who makes the movie watchable. It is her energy and talent that move the film along. The movie was all fine and good, but I wouldn't recommend anyone pay to see it. That's what cable is for. And if you've seen Once, you've kind of seen Twice Begin Again. Oh - and they couldn't even be bothered to alter the poster images that much. 2014 Movie Count / Goal: 4 of 12. I'm wondering if it was the same one we saw. Just about all we agree on is that 'Once' was better, though I'd say "EVEN better".